A pendant to show off that broken heart! 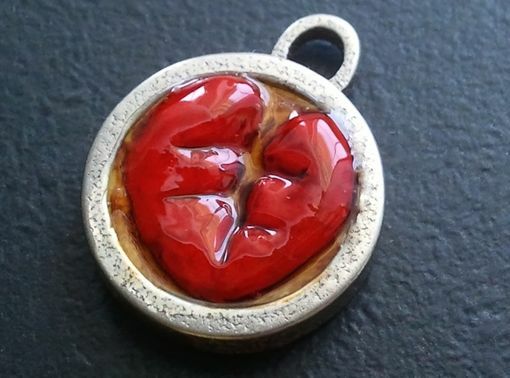 I made this pendant from polymer clay which was hand shaped and carved before and after being set. No molds used. I then painted it and gave it a protective seal. Even the thick stainless steel pendant was made by me and not purchased, so this is a truly unique item. The second picture shows the pendant blank. The diameter is 19.6mm (0.77 inch)and the thickness is 3.9mm (0.15 inch).